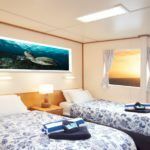 The Ningaloo Reef has been called the last frontier by some divers and, unless you have your own ocean going yacht, will be the most pristine reef setting the average person can find. Isolated by distance from the effects of man, the reef provides divers pristine dive sites many just a short swim from shore. 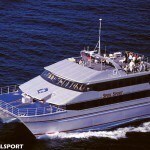 Day boats operating out of Exmouth or from Coral Bay have hundreds of dive sites to choice from. 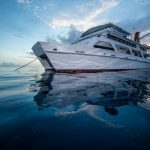 It is not unusual to spend three or four days out diving on the reefs and not see another boat. 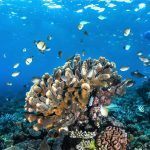 There are over 500 species of fish and 300 of coral, it is also a location that has influences of both temperate and tropical marine life. The Leeuwin Current, one of the worlds major currents passes just off shore and influences the reef. 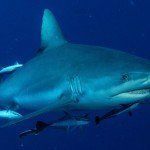 The Leeuwin current is also a factor in the migratory route of some marine life and is a portion of the reason that the Ningaloo reef has the largest migratory concentration of whale sharks in the world. Shortly after the whale sharks leave the humpback whales can be found, at times with calves. This is also the largest nesting grounds for sea turtles. Manta rays are found year round as are the large groper members, many species of sharks and other rays, and dugongs. The Ningaloo Reef is a World Heritage site just like the Great Barrier Reef, however, unlike the GBR the Ningaloo site also includes a rugged land portion. The land side complement the reef with imposing landscapes, huge gorges and an untamed wilderness. Ningaloo Reef is a fringing Reef, the largest Fringing reef in the world, the third largest reef in the world and is just shorted than the Belize Barrier reef. A fringing reef is one that is close to shore and many times will touch a shore. They offer protection from heavy open water waves, often they will run out from an island before curling in front of it. A Barrier Reef is an off shore reef that is adjacent to the continental shelf, on the shelf side the water quickly drops to 1,000 meters or more. Behind a barrier reef is a wide lagoon of sheltered waters generally between 20 and 50 meters getting shallower than nearing the shore. On the Great Barrier Reef the Outer reefs on the Continental shelf averages 30 to 100km away from land. On the Ningaloo reef, the shelf is as close as 3 km and an average distance of only 6.5 km. 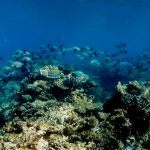 This gives the Ningaloo Reef some of the marine characteristics of the outer reefs, well feed marine life from the rich up flows from the deep currents. 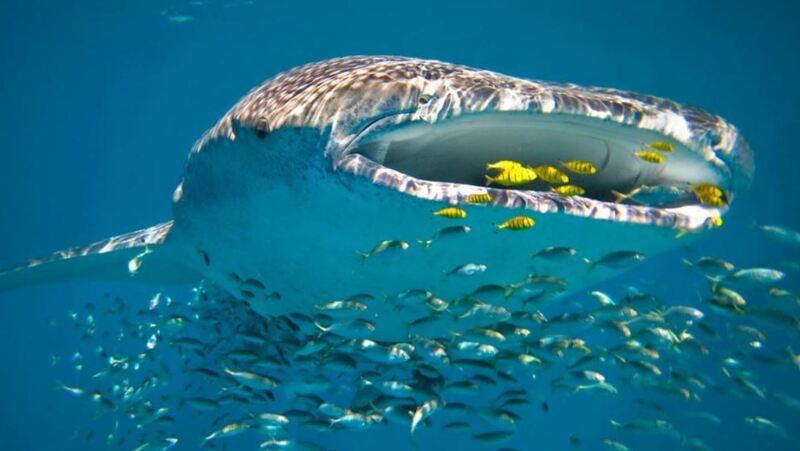 There are two larger population centers around the Ningaloo Reef area and a number of smaller ones. Larger is a relative term. Exmouth where most of the diving and the Liveaboards start from has a population placed at below 3,500. 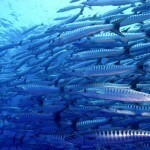 Situated near the northern end of the reef, It is located 1,2760 km from Perth and served by an airport about 35 km away. 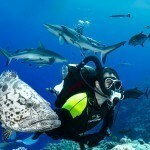 The majority of the day dive operators dive in the area known as Exmouth cove. There are hundreds of potential dive sites here. Many divers will do a number of shore dives, however often they find it just as rewarding to simply snorkel from the shore sites. Reefs can be found as close as 30 meters from shore in less than 3 meters of water. 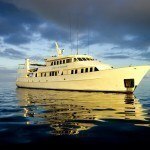 There are limited Liveaboards that operate in the Exmouth region. Charter options are all that are available and these are from March through to October. 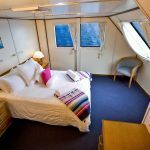 The Windcheetah vessel can sleep up to 10 and can be chartered from a minimum of 24 hours. The other major population center is Coral Bay which is located about 150km south of Exmouth. Coral Bay has a population of about 200, and just recently was pleased to announced that the self service gas station would be open 24 hours for those using credit cards at the pump still no attendant on duty at night. However, this little town is a tourism power house with tourism being its major industry. Snorkeling and fishing are two of the biggest draws with hiking and ATV treks also being popular. During holiday season the population of the town grows to 2,000 and they host over 200,000 tourist a year. The Continental shelf is very close here and the fringing reefs can be reached from shore. Snorkeling is more popular than diving as the reefs are very shallow. Recreational fishing boats can be out in open waters seeking trophy fish in under 30 minutes. 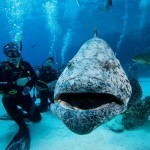 If you want a location with few divers and pristine conditions then the Ningaloo Reef is the place for you.